If the currency goes back up at the dawn of the times, it is necessary to wait for the 7th century av. J.-C., and then the Greeks, to see the appearance of struck metallic coins. This innovation was a turning point in the history of the money. In antique Greece, level of development of the currency, its use, even the existence or not of coins vary from a city to the other one. Independents, the Greek cities are free to opt for the system of their choice. 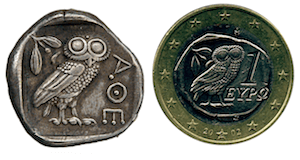 In time however, certain common standards are going to become established to determine the weight and the silver content and, in 5th century, the Athenian coin, raising an owl on one of its faces, becomes the reference currency. At that time, Athens took the lead of the league of Délos, an alliance between Greek cities against the Persians. It is the master of seas and is the dominant commercial power. But even after its defeat against Sparta at the end of the 5th century, further to the Peloponnesian War, its owl will continue to be used. She will lose her aura only with the increase in importance of the Macedonia where she will be supplanted by philippes and alexandres.